Hannah went from being wary of commitment to being married within months. She moved back to London, resigned from her job to be with fellow Brit, Mark. He frequently traveled back and forth between London and New York. So when he wasn't at the airport at the scheduled time, Hannah wasn't too concerned thinking she mixed up the days or that her husband's schedule changed last minute. Sure enough, Mark called to explain why he missed the flight and why his return home would be delayed. "A farce," he called it. But women's intuition kicks in and a voice keeps telling Hannah something isn't right. When Mark's assistant and business partner both contradict his whereabouts, Hannah really starts questioning where Mark is and uncovers secrets. Why was the mortgage extended? Why has Hannah's bank account been emptied? Who was her husband before they met? I added Before We Met to my reading list after seeing it on a couple recommended reading lists. 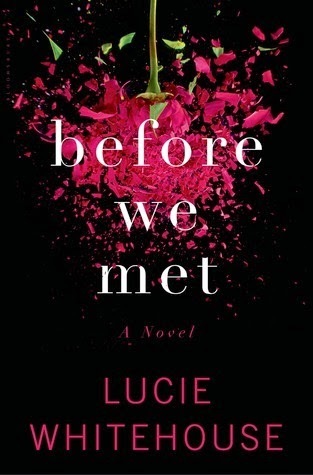 This is my first novel read by England-born/New York resident Lucie Whitehouse. Good first impression. While the book was good, I think it would be even better on screen. There were some parts where I would've liked to really see Hannah's reaction. Instead I played my own version of the scenes in my head as I read along. Don't you just love books that let your imagination go where the words take you? This is all the more reason for me to recommend reading Before We Met to mystery bookhearts.